Rose Namajunas says Joanna Jedrzejczyk isn’t doing herself any favors. 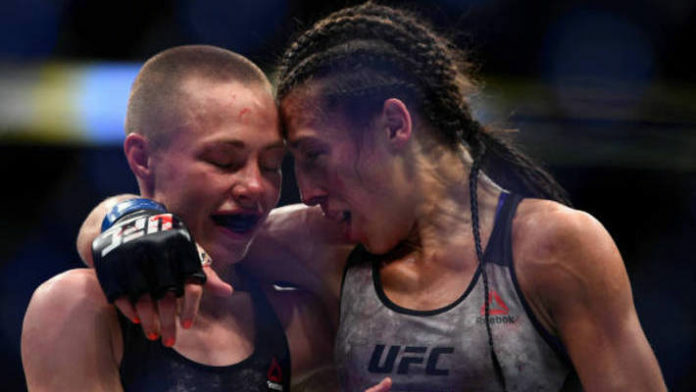 Namajunas ended up being Jedrzejczyk’s most fierce rival, defeating the previously unbeaten champion twice. Namajunas earned a first-round TKO over Jedrzejczyk at UFC 217 to capture strawweight gold. She then earned a unanimous decision win at UFC 223 to retain her title in a rematch. While Namajunas heals, a pivotal strawweight clash will take place. Jessica Andrade and Karolina Kowalkiewicz will do battle on Sept. 8 on the UFC 228 card in Dallas, Texas. The winner could go on to challenge “Thug” Rose. It’ll be interesting if Kowalkiewicz emerges victorious because she holds a split decision win over Namajunas. Do you think Joanna Jedrzejczyk should just accept her losses and move on?